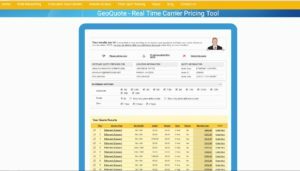 GeoQuote is a free, real time carrier services pricing and locating tool. This article is a brief summary of GeoQuote and how it is used. There are over 3,000 carriers or broadband providers in the USA offering a wide range of connectivity and bandwidth services including high speed Internet access, point to point fiber optic links, VPNs, MPLS and voice services. This translates to tens of thousands of point of presence and pricing plans available at different locations throughout the US. It can be a daunting task for businesses to sort through the suppliers, their offerings, pricing plans, and whether they are present where service is required. 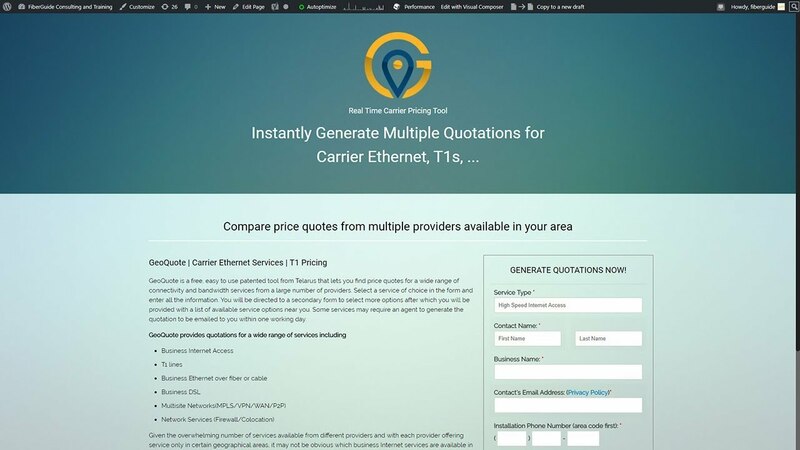 GeoQuote is a convenient tool to generate real time data on carrier services availability and pricing at any given address in the United States. Geoquote can be accessed by visiting https://fiberguide.net/geoquote. After entering the type of service and all the contact information requested, you will be taken to the second screen where you can select details of the required service. Real time data is immediately displayed with many plans to choose from and the link to place an order. Once an order is placed, we will review it, prepare carrier contract documents, and send them to you in a couple of days. In the following example depicted in the image, high speed Internet access was selected as the service type and Ethernet over copper as the service of interest. Instant results revealed 123 plans showing bandwidth, installation fee, rebate, whether a router is included and the monthly cost. In the event that your solution is complex, for example if you require thousands of sites to be connected, contact us and we will call you to discuss details. An agent will then run a Bulk GeoQuote program and present you with some options that meet your requirements.